It's Groundhog’s Day! Perhaps the most "celebrated" weather day of the year....but it really has less to do about the groundhog and more to do about the fact that February 2nd is the midway point of the Winter Season. 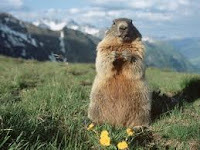 According to folklore, if the day is sunny and the groundhog (otherwise known as a woodchuck or marmot) sees his shadow, then we will have six more weeks of winter. If the day is cloudy and the groundhog doesn’t see his shadow, then spring will come early. The thinking here is, that if it is a sunny day in early February, then something is amiss with the weather and the groundhog will dive back in his hole, expecting that winter weather will likely return in March. If it is cloudy, and he can't see his shadow, then the weather situation is "normal" and spring should arrive early. At least that is one interpretation of the myth surrounding the groundhog. Truth is, groundhog's rarely come out of hibernation and show their faces before the end of March. With the exception of a few domestically held groundhog's & marmots like Punxsutawney Phil & Lander Lil. The real reason for celebration is that Groundhog’s Day does mark the midway point of the Winter Season. Winter is 12 weeks long, and February 2nd is exactly the midway point between December 21st (the solstice) and March 21st (the equinox). Regardless of what the groundhog says, we will always have 6 more weeks of winter between today and March 21st, according to the calendar at least. Spring may come early to some parts of the country, and we may see some “spring-like” weather here in Jackson Hole before the third week in March. But rarely is our winter weather over with before March 21st.